These tuning fork sets are very unique in that they are backed by years of scientific and historical research into the unified field of sound, Sacred Geometry, color, ancient music traditions, and the harmonic proportions found in nature. For those explorers of the ancient science of alphabet-number correlations known as Gematria, or Alphanumerics, we make tuning forks to numerical correspondences from Greek, Hebrew, and other languages and sacred texts. 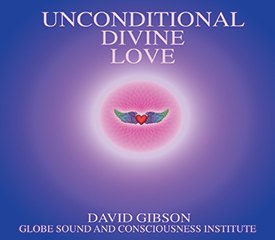 Many people love to sing and tone with the tuning forks. Others like to use them on and around their body, often by placing them on or near acupressure or meridian points and chakra points. 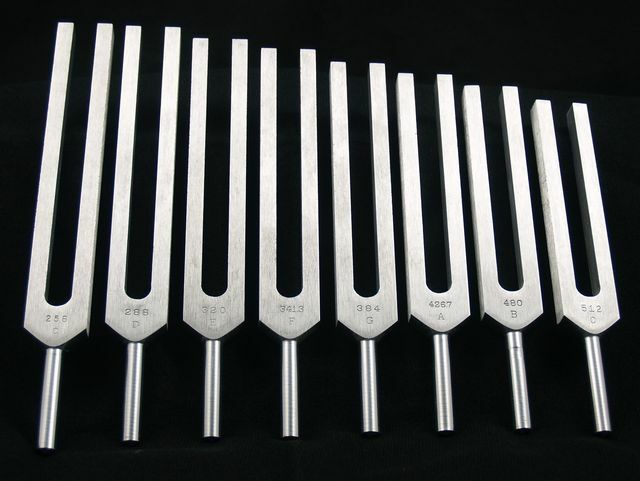 The tuning forks are made of a special sonically improved and polarized aluminum alloy. They are superior for their ability to deliver superb tone quality, lengthy sustain, and beautiful harmonic overtones. Aluminum is chosen for its tonal beauty and quality of sound. Its sustain is significantly longer than steel forks made to the same pitch. In addition, aluminum is undisturbed by electromagnetic interference. Leading edge science recognizes the multi-dimensional interface characteristics of certain aluminum alloys. Weights, or Resonators, enhance the production and delivery of solid and deep fundamentals. These tuning forks produce a minimum of additional overtones because they emphasize the fundamentals. Our unweighted tuning forks are for an overall range from 250Hz to 5,000+Hz. Our unweighted forks use a proprietary prepared alloy of aluminum and give off wonderful overtones and harmonics. 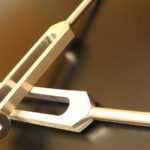 Our tuning forks use a special grade of space industry aluminum that is harder than most aluminum and can be sounded to give off more overtones and harmonics, thus a more beautiful tone. Not all aluminum is created equal. We use the very best special aluminum, a very precise temperature control is used when tuning them at the manufacture and each fork is custom made and hand tuned individually with very special scientific equipment that can be sensitive to 5 decimal places of accuracy, as opposed to mass manufacturing and only one decimal place. All of our forks come in custom made cloth pouches to any specification. We can make forks from 22Hz all the way up to about 5,500 Hz, with 4096 Hz, C being the highest note on an 88 key piano when middle C is 256 HZ. The Schumann Frequency occurs naturally in the atmosphere triggered by lightning. It is a frequency that entrains the brain into the threshold of Theta and Alpha. It is the main frequency that connects us to the nature. NASA has discovered that we can get sick if we don’t get the frequency. It is wiped out by cell phone towers and electromagnetism in the city. When you have two frequencies that are close to each other, our brain makes up the average. This is called the carrier frequency. We also hear the difference frequency as a rhythm. It is important the the carrier frequency and difference frequency are in tune. 432 Hertz is the Frequency of cells, Ancient Egyptian Tunings, Radius of the Sun, Average Frequency of Baby Cry, Heart Meridian, and creates a beautiful Cymatic Pattern. 216 Hertz is the frequency of the Honey Bee which has been shown to levitate. 108 Hertz is a majorly auspicious number in India. The Sun is 108 times the distance to the moon. 54 Hertz is 3 octaves below 432 and resonates a powerful bass frequency. Any combination of these forks creates a beautiful harmonious octave energy. These forks are based on mathematical formulae of their rotation and spin. The earth frequency is based on the rotation of the earth around the sun. The moon is based on the rotation of the moon around the earth. The sun freqeuncy is based on the spin rate of the sun. In 1978 Hans Cousto, a Swiss mathematician and musicologist discovered the natural law of the “Cosmic Octave” as the link between different kinds of perodically occurring natural phenomena, such as the orbit of the planets, the weather, colors, rhythms and tones. The frequencies are based on his original calculations. A key factor for effective revitalization of water is the basic procedure of restoring the correct fundamental frequency and overtones for water to pass through the cell membrane. In order to pass through the cell membrane and be conducted into the cell, as research by Nobel prize winner Peter Agre shows, water must have a very specific structure, namely crystalline. In addition, the water needs to have the correct frequency so as to be able to pass through the aquaporins (ionic channels in the cell membrane) in sufficient amounts. Research carried out by bioresonance expert Paul Schmidt has revealed that the frequency of the cell membrane is approx. 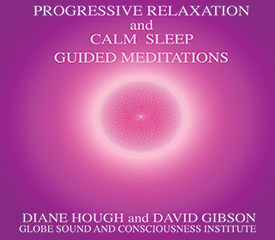 22.5 Hz, corresponding to the body’s own metabolic frequency. Investigations into frequency carried out by the Swiss institution, Planet Diagnostic, have shown that good quality spring water always has a fundamental frequency of 22 Hz and its overtones of 44 and 66 Hz. These frequencies also overcome the negative frequencies of Ultra Violet disinfection and other chaotic electromagnetic frequencies. As well as deleting the frequencies of harmful substances, it gives our drinking water a highly structured, stable, liquid-crystalline state – so it is 100% available for metabolism. – Exactly 2 Octaves above 108. Paul Schmidt has done some of the most extensive research on the frequencies within the human organism. The frequencies of these tuning forks is based on his research. 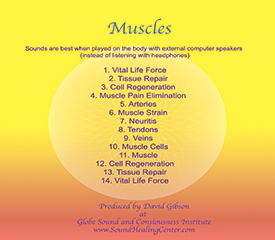 According to Paul, all tissues like skin, liver, bones and other organs have their own oscillation and resonate on their own special frequencies. Bioresonance Paul Schmidt means seeking and then passing on all the frequencies necessary for the stimulation and final regulation of the organism and giving the body the chance to selfregulation. Order forks tuned to any frequency you like. Just email us the frequency. About 3 weeks to be made up and shipped.